Luxury watch brand Frédéric Jouvenot presents a new watch: Inti, a world premier timepiece featuring jumping heliocentric display. Now you are going to ask what exactly is heliocentric display. Well as you will know, this all relates to Kepler’s third law whereby in the heliocentric theory the distance of the planets from the sun was determined by the size of the retrograde loops. For example, a small retrograde loop signifies that the planet is far away from the Sun. On the other hand, a large retrograde loop would signify that the planet is close to the Sun. You’re lost aren’t you. 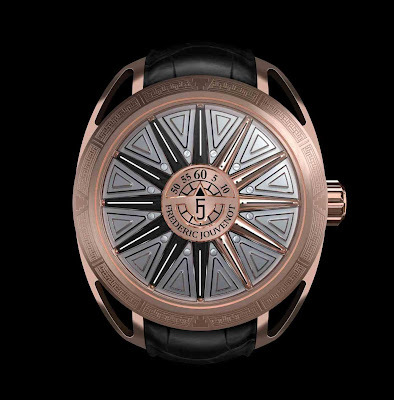 Never mind, Frederic Jouvenot called the watch Inti as a tribute to the Inca God of sun, and the sun-shaped hour display is certainly unusual if not unique. The watch claims to be the first hour display over 24 hours that shows the sun’s path and the alternation of night and day. 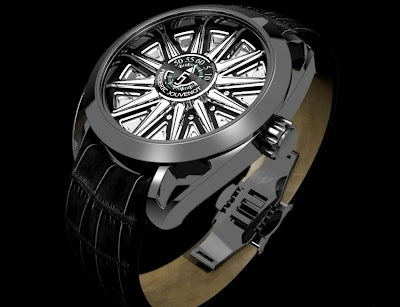 A complex mechanism in Frédéric Jouvenot’s Solar Deity collection has two faces, corresponding to the day and night cycles. The time can be told without conventional hands, numerals or disks. Each hour is represented by a radioconcentric sunbeam, i.e. starting from the centre and radiating towards the edge of the dial. The twelve sunbeams show the path of the sun on the dial while indicating the hour to come and the past hour. At mid-day, all the sunbeams are golden to represent daylight. At that precise moment, the dial represents the sun at its zenith. As time passes, the rays become black, one after another, clockwise; the dial darkens and announces oncoming night. Midnight is represented by twelve dark beams reflecting in the night. To symbolise the return to light, the sunbeams take turns to pivot again until mid-day, thus completing a full 24 hour cycle. Telling the time remains instinctive. Each hour keeps its conventional position and the minutes are indicated by a central cartouche fitted with an index that completes a revolution on the fixed minute disc. The display maintains the conventional angular gap of a watch for instinctive reading. The whole complication mechanism is enclosed in the central 12 mm diameter and 5 mm high case which contains no fewer than 100 parts, including 24 rubies which will activate the hour’s jumping beams. For example: at 3.30 p.m., the first three beams are black and the minute indicator points to 6 o’clock, as on a conventional dial. The conventional angular gap between 3 o’clock and 30 minutes is thus maintained. 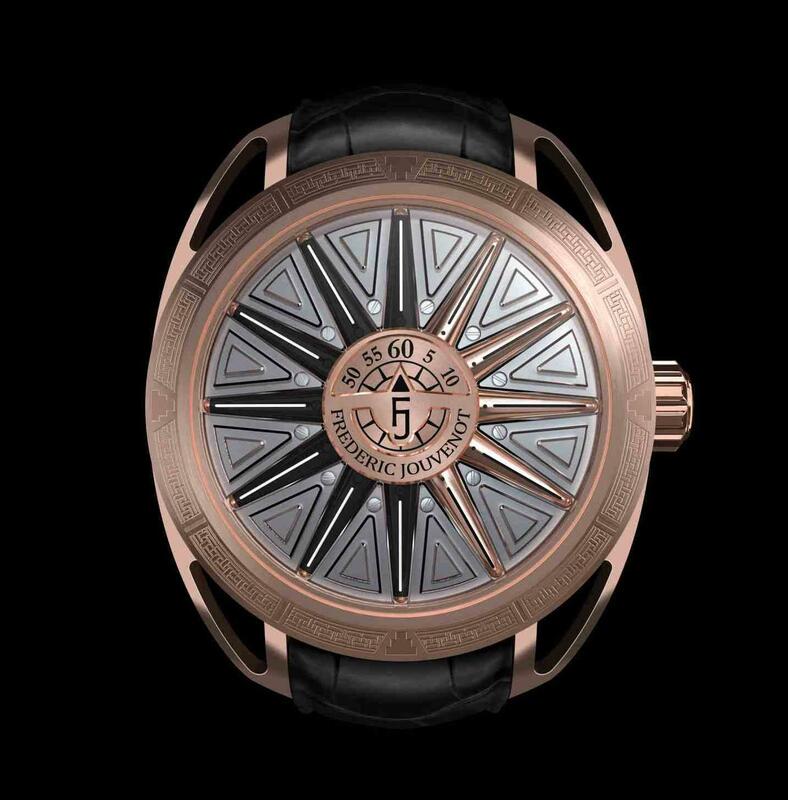 The feat accomplished by Frédéric Jouvenot is to maintain conventional reading of the dial with a revolutionary hour display system.